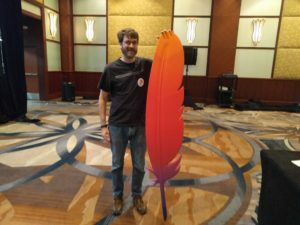 Last week I attended ApacheCon North America in Miami. I am the conference chair of ApacheCon, and have been for on and off for about 15 years. Red Hat has been a sponsor of ApacheCon almost every single time since we started doing it 17 years ago. In addition to being deeply involved in specific projects, such as Tomcat, ActiveMQ, and Mesos, we are tangentially involved in many of the other projects at the Apache Software Foundation. I’d like to draw specific attention to Alan Gates, at Hortonworks, who has developed a course to train people at the company in how to work with upstream projects. He did this because, as the company expanded from a small group of founders who deeply understood open source, to thousands of employees who kinda sorta got it, but not always. Also of great interest was the keynote by Sandra Matz about what your social media profile tells the world about you. It’s worth watching all the way to the end, as she doesn’t just talk about the reasons to be terrified of the interwebs, but also about how this kind of analysis can actually be used for good rather than evil. ApacheCon is a high point of my year, every year, going back to March of 2000. In late 1999, Ken Coar told me I should submit a talk for ApacheCon. Astonishingly, my talks were all accepted, and I found myself in Orlando speaking in front of a few hundred people who thought I knew what I was talking about. I have since made a career out of that particular game. This is the 28th ApacheCon since the creation of the Apache Software Foundation. 29 if you count the event in 1998 before there was a Foundation. I don’t count it, because I missed it. I also missed the ApacheCon in Sinsheim, Germany, in 2012, for which I will never forgive my boss at the time. But I *think* I have been to more ApacheCons than anyone else. 27 of them. I love being on stage. With hundreds of people looking at me, hanging on my every word, believing I know what I’m talking about. But there’s other reasons I love ApacheCon. It’s the place I go to see some of my oldest friends – many of whom I first met at ApacheCon, including some new ones this week. I love ApacheCon because it shows me that I’m not alone. As C. S. Lewis said, we read to know that we’re not alone. Except that he didn’t say it. It’s actually just a quote from a movie about him. I love ApacheCon because I love Apache. And Hawaiian shirts. Shane’s lightning talks are another high point of my year, because they are both entertaining and informational. Except I hear he’s not giving one this year. I love ApacheCon because of the passion that I see in the people that attend. People that love Apache, and also love solving actual real world problems. The sessions here at ApacheCon range from the esoteric and philosophical to the deeply practical, but at the heart of each one is a desire to solve problems in the real world. To scratch your own itch, as the saying goes. I love ApacheCon because of our sponsors. Talking to sponsors about why they are here at ApacheCon has the effect of re-centering us. Sure, open source is about having fun and tinkering, but it’s also about solving problems for real people that rely on us. People that depend on Apache because we have a reputation for vendor-neutral, high-quality software which is sustainable because of those esoteric philosophies that we cling to even in the face of practical realities. I love ApacheCon because of the time I’ve put into it. I’ve worked on ApacheCon for 18 years now. I often refer to ApacheCon as my life’s work. I spend hundreds of hours on it, and so do many other people, including our amazing producers, our numerous volunteers, our tireless Infra contractors, our beloved Melissa, and our supportive board of directors. ApacheCon is my sweat and tears, literally and figuratively. It’s older than two of my kids, and the oldest kid grew up knowing that Dad loves ApacheCon. The wall in my office is covered with ApacheCon attendee badges – 27 of them. And ApacheCon has become a part of my identity. So as we look forward to the next ApacheCon (details coming very, very soon, I hope) we need to figure out what *you* want ApacheCon to be, and make it that, rather than doing it just because it’s what we do, and what we’ve always done. ApacheCon is about building community, more than it’s about anything else, and that’s really why I love ApacheCon. I love seeing communities come together around a common goal, and believing that I was a catalyst in making that happen. So, thank you so much for coming to ApacheCon, my friends. I hope you’ll come again, and I hope that you’ll come to love it as much as I do. But that might not be possible. We just got done with ApacheCon Europe in Budapest last week – http://apachecon.eu/ – and it’s time to start thinking about ApacheCon North America. We’ll be holding ApacheCon North America, April 13-17th, 2015, in Austin, Texas. The call for papers is already open, at http://apachecon.com/, and we are hoping that this event will represent the breadth of the Apache Software Foundation projects. We’ve found that the very best way to have a project well represented in the content tracks is for someone deeply familiar with the project to craft an ideal track schedule, and then solicit speakers for those sessions. This has two immediate benefits. First, it goes a long way to ensuring that the topic is covered with the breadth that it deserves, rather than having a few random talks that cover random esoteric parts of the technology, and ignore segments of the audience that you most want to attract. Some talks require certain speakers. You know this a lot better than we do, because it’s your project. We need your help to go to those specific speakers and encourage them to submit the specific talk(s) that you know they’ll shine at. Once the talks have been submitted, we’re going to need your help reviewing them and building the schedule. To help with the review process, you’ll need to create an account in the CFP system (if you haven’t already done so) at https://identity.linuxfoundation.org/user and then email me – rbowen@apache.org – with your username, so that I can get you added to the review system. From there, you’ll see a list of talks to consider, and you can rate them according to how well you think they’ll fit the conference. Of course, if you specifically solicited those talks, then you’ll quickly mark them as “Strongly Accept” with a comment of “I solicited this specific talk”, and move on. (The CFP review interface is at http://events.linuxfoundation.org/cfp/cfp-list if you already have an account.) You can review talks from other topics/tracks, too, if you feel that you have some domain knowledge. Once the review process is complete, we’ll select the talks that rate the highest, and at that point we’ll be back in touch with you to help us order them correctly. Here, again, if you’ve already approached us with a layout of your ideal content track, there’s really nothing else to do. But if there are other talks that made it in through the review process, we’ll need help. If you want to have a sponsored hackathon specifically for your project, we can find room to make that happen. Just get in touch with me, and we’ll work out the details. Talking before the event about what you’ll be working on has a number of benefits. First, it gives people time to think about how they can contribute, and plan accordingly. Second, it encourages people to come in from the edges of the project to participate more fully in the life of the community, because they can select something that they’re particularly interested in, and work on it in company with the rest of the project members. Using the ApacheCon wiki – http://wiki.apache.org/apachecon/ – as a place to work on your hackathon topics gives conference attendees an easy way to find topics that they might be interested in, and connecting with the community. If you don’t have write permissions to the wiki, send me your wiki username, and I’ll get you added to the access list. Your company uses Apache software every day. Perhaps you even contribute to a project as part of your day job. ApacheCon is the best place in the world for your company to show off their involvement in Apache, and to find new talent to work on their products. Sponsorship of ApacheCon gives you a platform from which to talk about what your company does, and gets your company name recognized – and closely associated with Apache – by the people that make the decisions in some of the most important places in IT. If you’d like to sponsor ApacheCon, get in touch with me, and I’ll get you a sponsor prospectus, and help you select the sponsorship opportunity that’s right for you – whether that’s the conference lanyard, an evening reception, the conference bags or tshirts, or a booth in the exhibit hall. There’s something for every budget and level of exposure you’re looking for. You have the ear of your project community – both the developers and the end users. We need your help telling them about this event. Right now, we need you to tell them to save the date. Later on, we’ll need you to be telling them about specific talks that will be of interest to them, both directly relating to your project and about other related projects that they should know about. Join the Community Development mailing list – http://www.apache.org/foundation/mailinglists.html#foundation-community – where we’ll be posting suggested tweets, suggested things to share on Facebook and Google Plus, and other suggestions for helping us get the message to the communities where you have a more trusted voice than we do. This is critical – it does no good putting together a great event, if nobody comes. You know who needs to hear the message, and you know where they hang out. A well-placed message by the trusted members of the community is far more effective than a dozen mass emails from a stranger. So, if you’d like to help us make ApacheCon a success, get onto the Community Development list – http://www.apache.org/foundation/mailinglists.html#foundation-community – and on the #apachecon IRC channel on Freenode, and speak up. Tell us what you can do, and we’ll find a place for you to fit in.